Sweater, n.: garment worn by a child when its mother is feeling chilly. I was in Ireland a few years back and although, it was June, I was cold - the humidity got to me. So much so that the sweaters aka jumpers, I know as "fisherman knit", looked very appealing. Trouble was, I was on my way to France and the need for a fisherman knit sweater from June to September was unlikely. In Ireland they were called Aran sweaters. I owned one in high school and although I have often thought about getting another, the opportunity has not been there, other than that cool rainy June week in Ireland. I have friends who are knitters and I have knitted a few simple things however I can't imagine that my skills would even suggest that an aran sweater would be on any of my "to do" lists. While shopping in Paris at the end of October, there were many choices in many colours. Because of my height I do not care for a very bulky knit stitch and would choose one similar to the photograph of the Aran sweater here. in the Marais, Paris, October, 2013. It seems ironic, but I just bought a sweater in Paris, mind you it was October. 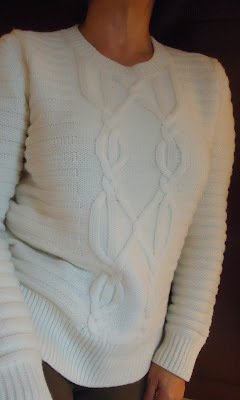 The sweater I finally purchased from a Sandro store in the Marais was not what I had in my mind exactly but after trying several on, I found that this style did not make me look like a "q-tip" - round on the top and narrow on the bottom. I did buy a creamy white one but I was looking for a pale creamy pink. I found one in that pale pink in a knit that was proportional to my frame at Galleries Lafayette but it was too big. This experience offers the following advice: even if you question the look on the hangar, try it on, it just might work better than the original image you had in your mind's eye.